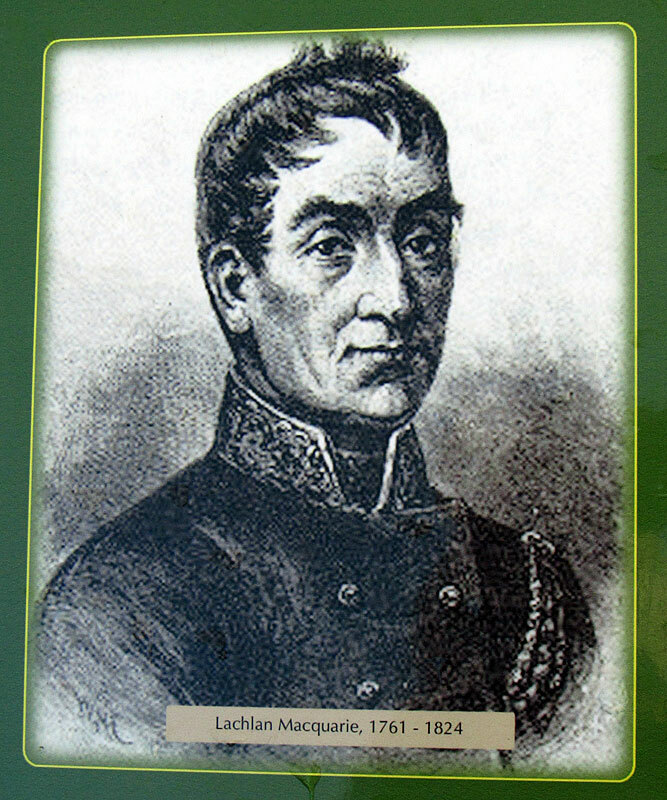 ​The Mausoleum of Major-General Lachlan MacQuarie (31 January 1762 – 1 July 1824) lies west of Salen, around 500 metres from the road along the rhododendron-lined drive to Gruline House. 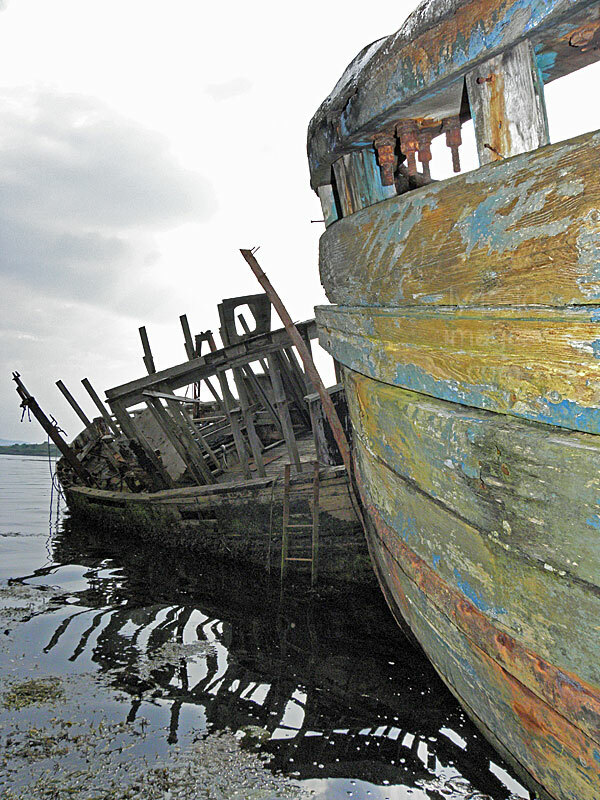 McQuarie was born in 1761 to parents who were farming folk on Ulva. He joined the army at the age of 16, during the American War of Independence, and steadily rose through the ranks to become Major-General. 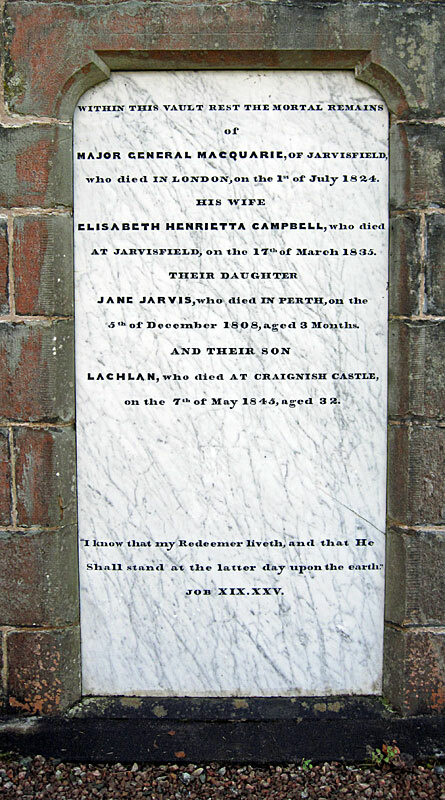 In addition to North America he travelled to Jamaica, Egypt and India where he met his first wife, Jane Jarvis, however, she died of tuberculosis after just 3 years of married life. 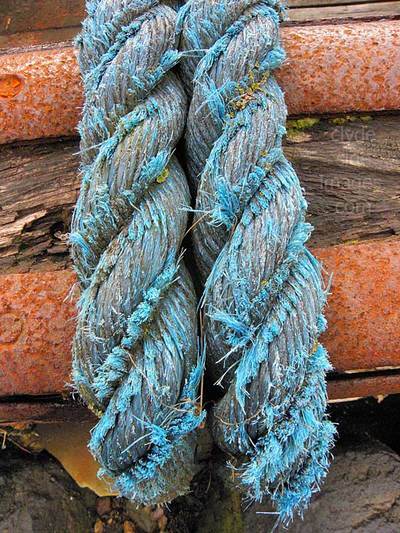 ​Macquarie had become quite rich during his time in India and on his return to Mull, he was able to buy 10,000 acres of land between Loch na Keal and the island’s east coast. 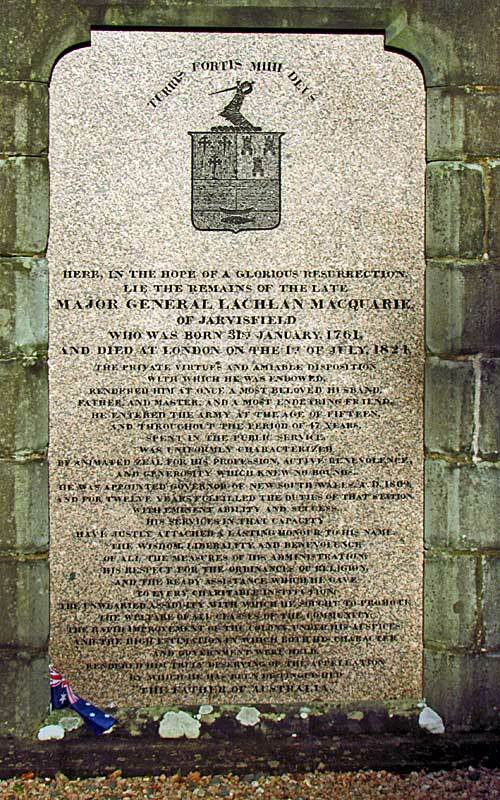 In 1808 founded the village of Salen, which he called Jarvisfield in honour of his first wife. It was on the island that he remarried. 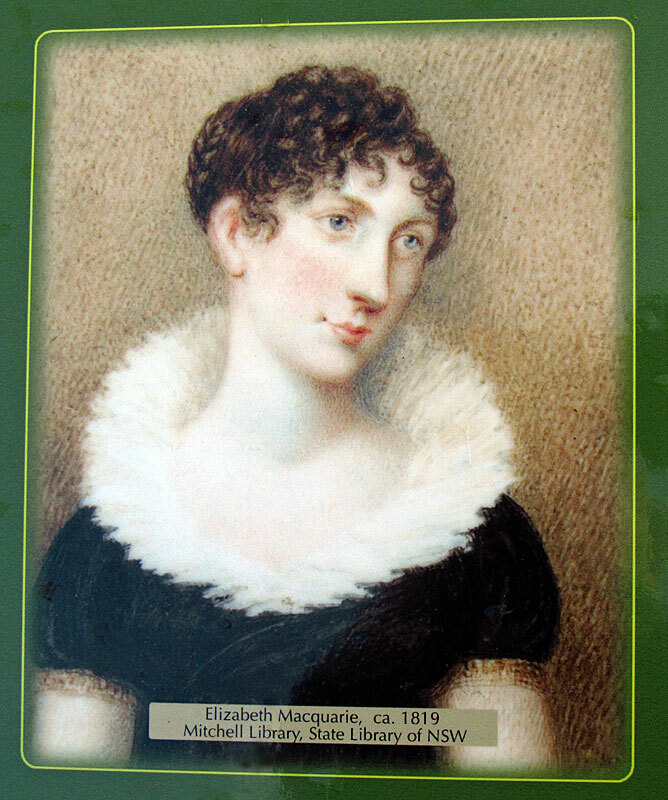 Elizabeth Campbell, his cousin, became his second wife and she accompanied him to Australia where he served as Governor-General of New South Wales between 1810 and 1821. ​These portraits and this drawing of Port Jackson, New South Wales, circa 1821, by Major James Taylor, 48th Regiment, is shown on the information board within the mausoleum grounds. The numbers of convicts transported to Australia increased dramatically during Macquarie`s time as Governor and he utilised the literally captive workforce to build roads, buildings, and even towns. 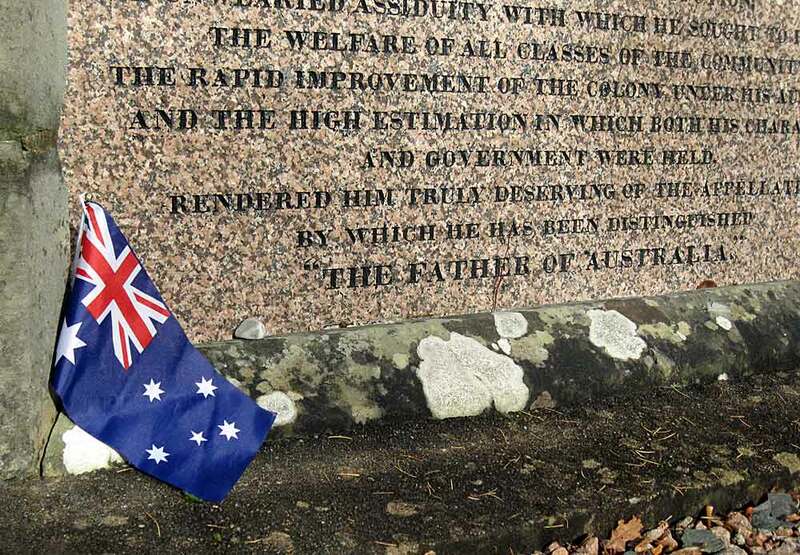 He gave the convicts the chance to earn tickets of leave but many ordinary settlers were hostile to the fact that criminals could settle alongside them and numerous complaints against Macquarie's government reached England. Tension between the settlers and the Aborigines increased and led to clashes. Macquarie believed that the indigenous population should be 'civilised' and that their traditional way of living should be replaced with Western ways and values. He set up a school in an attempt to educate Aboriginal children but most ran off and returned to their families after a very short time. He created a small town to teach Aborigines how to build houses and adopt European farming methods and he introduced legislation to place these native Australian people under British control. By the time Macquarie resigned in late 1821, in poor health brought on by the physical and mental demands of his position, he had served longer than any other governor. During his period in office 265 major works had been completed, including new army barracks, three convict barracks, various roads including a route across the Blue Mountains, stables, a hospital and five towns along the Hawkesbury River, which were out of reach of floodwaters. 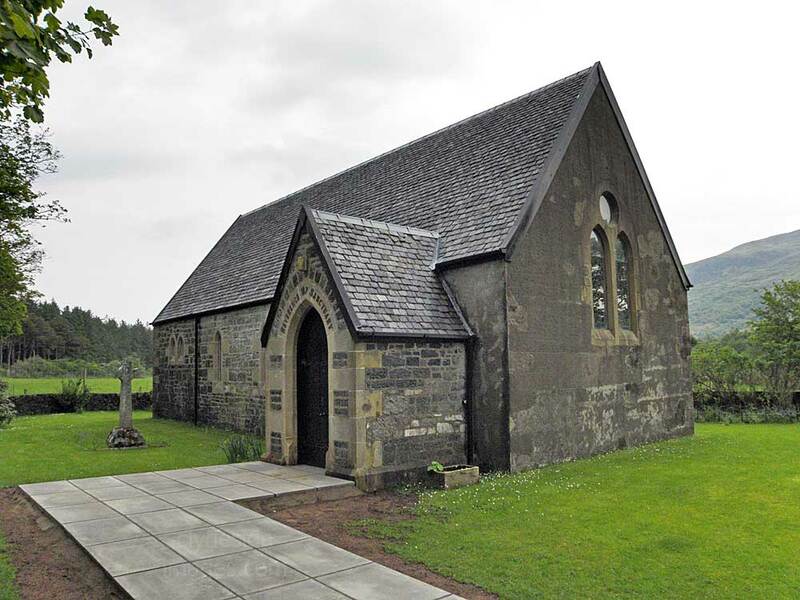 ​The St Columba Episcopal Church and grave yard, at Drumlang are situated nearby at Gruline beside the B8035 just west of the junction with the B8073. 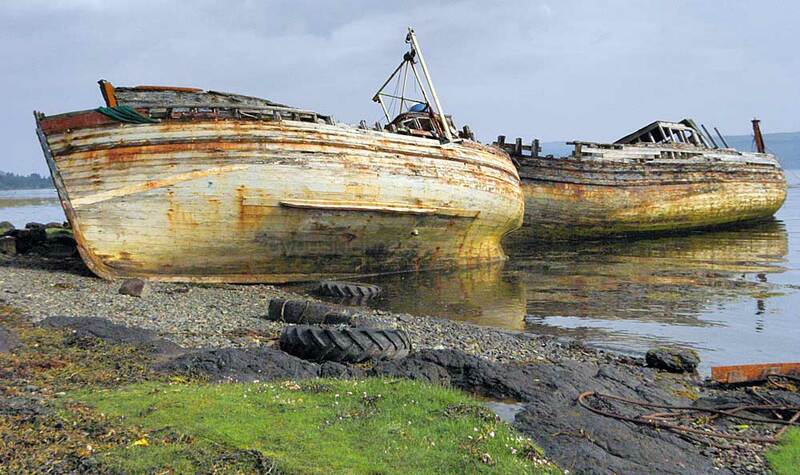 The first Episcopal services were held on Mull in 1864, although, in 1862 the Rev. Rawlinson, an Episcopal minister from Moidart, had visited Mull to consider the possibility of monthly meetings. 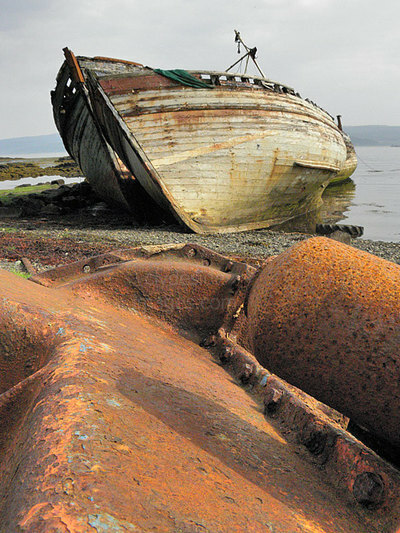 The first such service on the island was held at Salen by the Rev. Hugh McColl, a minister from Strontian and Kinlochmoidart on the mainland. 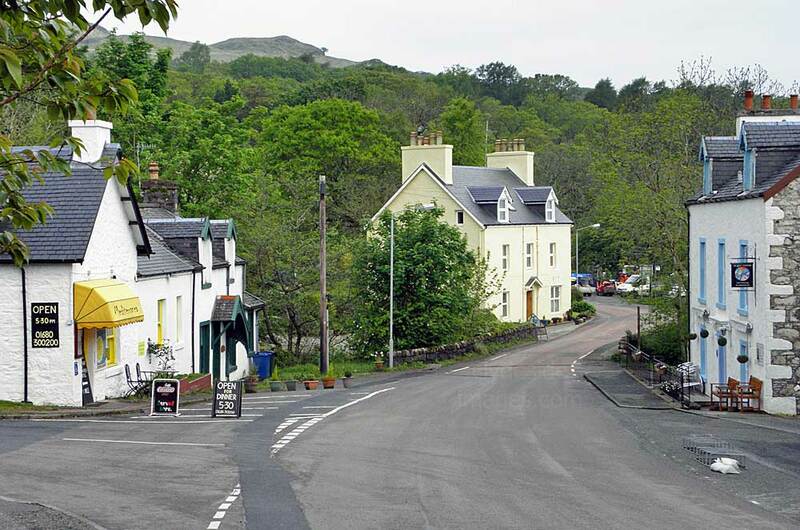 Services were then held in Glenforsa House (now called Gruline House) and at several other locations on Mull which Presbyterians and Roman Catholics also attended. It was mainly due to the efforts of General Charles Greenhill-Gardyne, the then proprietor of the Glenforsa Estate, that this church was built as a focus for Episcopalian worship on Mull, with the building reaching completion in December 1873. Greenhill-Gardyne was helped financially by Captain Parr of Killiechronan and together they bore the cost of the construction. The first service didn`t take place until June of the the following year when twenty-six people attended the morning service, which was in English, and 47 attended the evening service held in Gaelic. Finally, on 4th July 1875, the church was consecrated by Bishop George Richard Mackarness making it the first church on Mull to be consecrated for several centuries. It has never had a permanent, island-based minister with services usually led by visiting chaplains in summer and lay preachers from the community in winter. The church is in the simple ‘gothic revival’ style and incorporates several stained glass religious and memorial windows. St Columba and Mary and Joseph. Towards the rear of the church on the north side is a window by Charles Kempe depicting ‘Charity with two children’. Underneath the window is a plaque ‘in memory of Frederic Jameson Elles who drowned in Loch Frisa on 20 August 1911 at 12 years old’. His likeness is shown in the young boy who is standing at his mother’s knee. It is said to be one of the best examples of Kempe’s work. The wooden lectern, at the east end of the building, was given in memory of Gordon Frank Melles, who was killed in the Great War at the age of 30. The pulpit, also of wood, was made by Simpson from Kendal, Westmorland, but the carving of a design of crossed flag standards was done by Gordon’s mother, Mary Melles of Gruline. 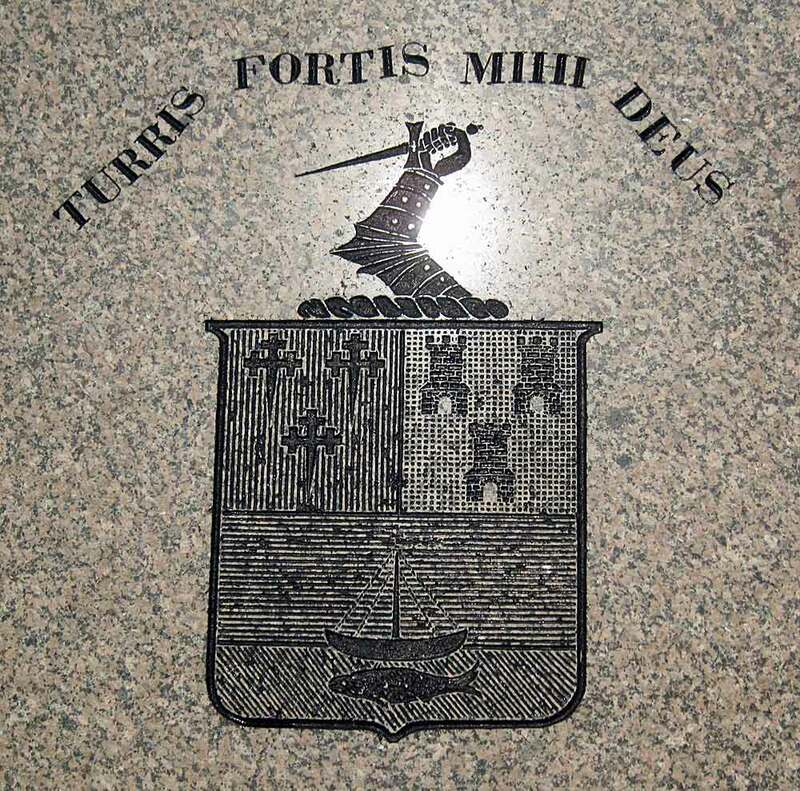 Inside the church and in the grave yard are many memorials, mainly to Episcopalian members of Mull`s landed gentry and those of officer class who were ‘killed in action’. 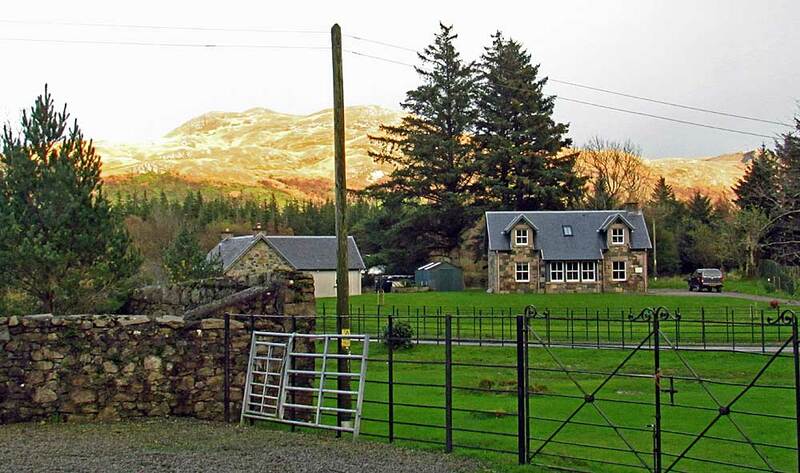 The Benmore Estate HQ is situated at Knock, near Gruline, just a few kilometres southwest of the Macquarie Mausoleum on the B8035 road, close to the head of Loch na Keal. Although it is large working estate, several rental properties are available and various guided activities including deer stalking, fishing and wildlife viewing are on offer. 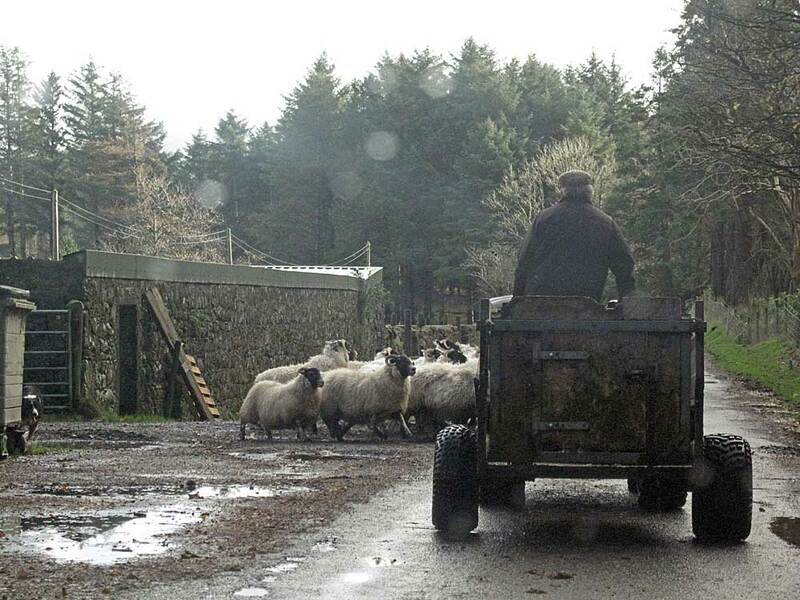 One morning, during a drive round the island, we had to wait here while some sheep were rounded up and penned, and by coincidence on the way back, we were held up again - it was cattle this time heading in the opposite direction. 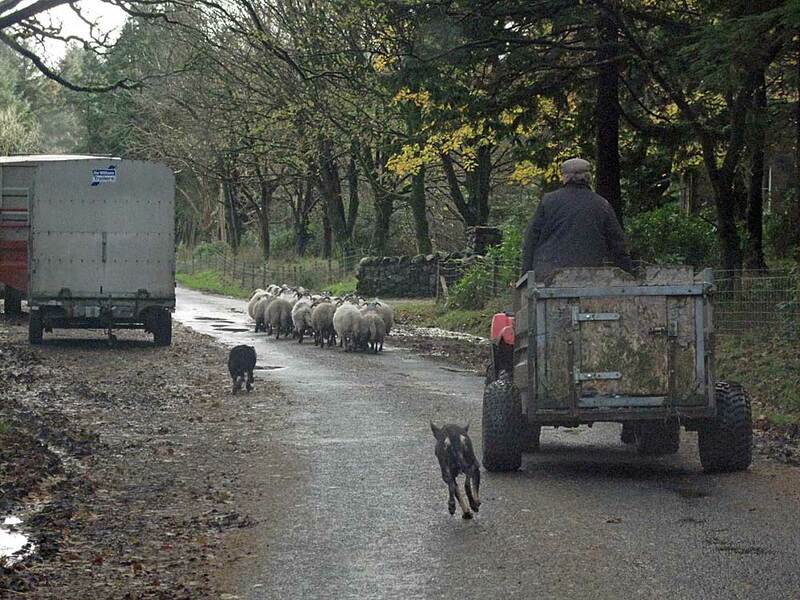 It looks as though the estate workers are kept busy here and so are their dogs - it`s great to see the animals in action. ​A statue of Macquarie stands in Hyde Park in the centre of Sydney and numerous streets, buildings and geographical features have been named after him.